Why should I create a Single Property Website? We get this question often. So we created a blog post. Can I use a custom domain name for each single property site like www.PropertyAddress.com ? Yes. 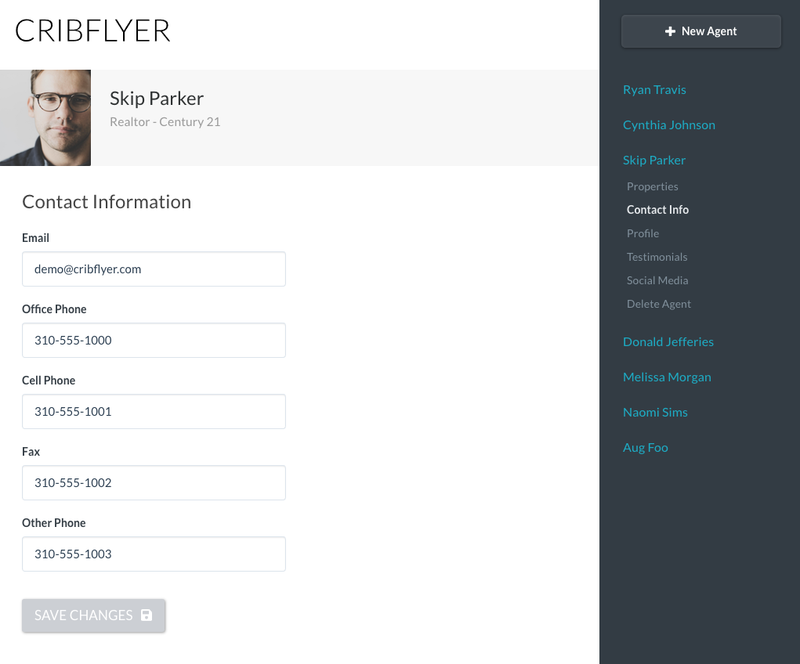 You can now buy domains names directly from CribFlyer in your admin panel! OR, you can point a custom domain name to any of your property websites by following the setup instructions in your admin panel. Watch video demo: How to setup a custom domain name for your single property website. Can I "white label" the CribFlyer service using my own domain name ? Yes. 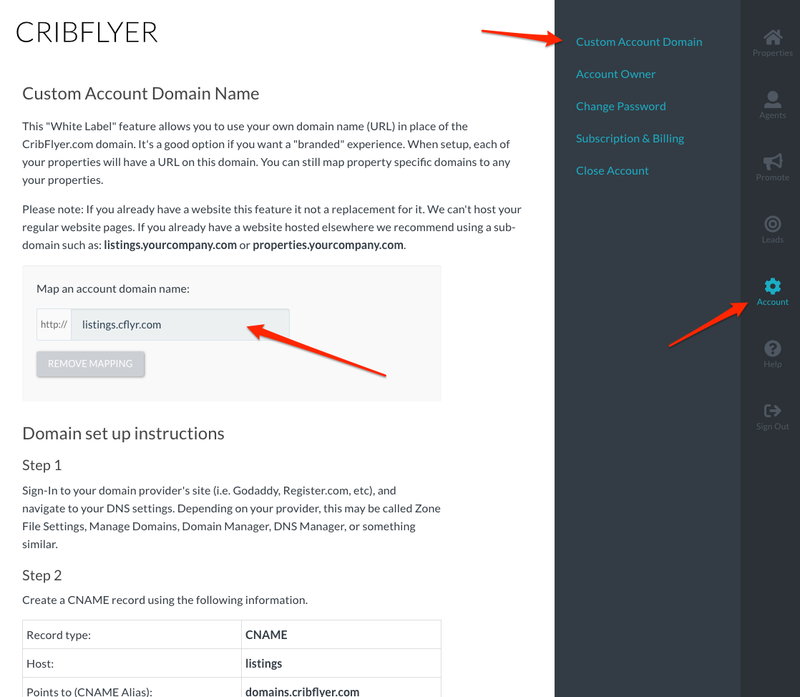 Our "White Label" account domain feature allows you to use your own domain name (URL) in place of the CribFlyer.com domain. It's a good option if you want a "branded" experience. When setup, each of your properties will have a URL on this domain. Many of our customers use our service to build and host "listing pages" to display ALL of their properties on a single branded URL such as listings.mycompany.com or properties.mycompany.com or tours.mycompany.com. Then each property gets its own page such as: listings.mycompany.com/444-Main-Street. 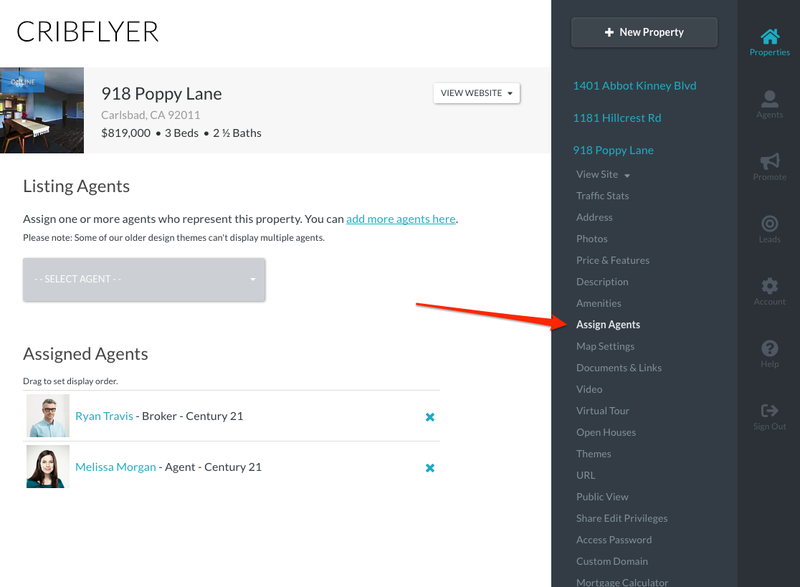 You'll still have the ability to map property specific domains to any your properties. Please note: If you already have a website this feature it not a replacement for it. We can't host your regular website pages. If you already have a website hosted elsewhere and want to maintain consistent branding then we recommend using a sub-domain such as: listings.mycompany.com or properties.mycompany.com or tours.mycompany.com. Can I change my property website URL ? Yes, a default URL is created and assigned based on your property address. However, you can change it to anything you want as long as it's not already being used by another customer. A default URL based on the address looks like this: cribflyer.com/615-hampton. Please note: Changing your public URL can result in broken links if the old URL was used to link from external sources such as social media sites. Can I capture leads (contact information) from visitors before they're allowed to view a property website? Yes. With a single click you can change the "view setting" of any property to require a visitor's name, email and phone before they're allowed to view it. The lead is immediately texted (SMS) and emailed to the assigned agent(s). Can I view traffic reports for my websites? Yes. We have reports of total unique visitors, sources of incoming visitors, locations of visitors and visitors by device (desktop, tablet, mobile phone). Can I upload and display PDF documents on my websites such as floor plans, legal forms, financial reports, etc. Yes. We've got you covered. 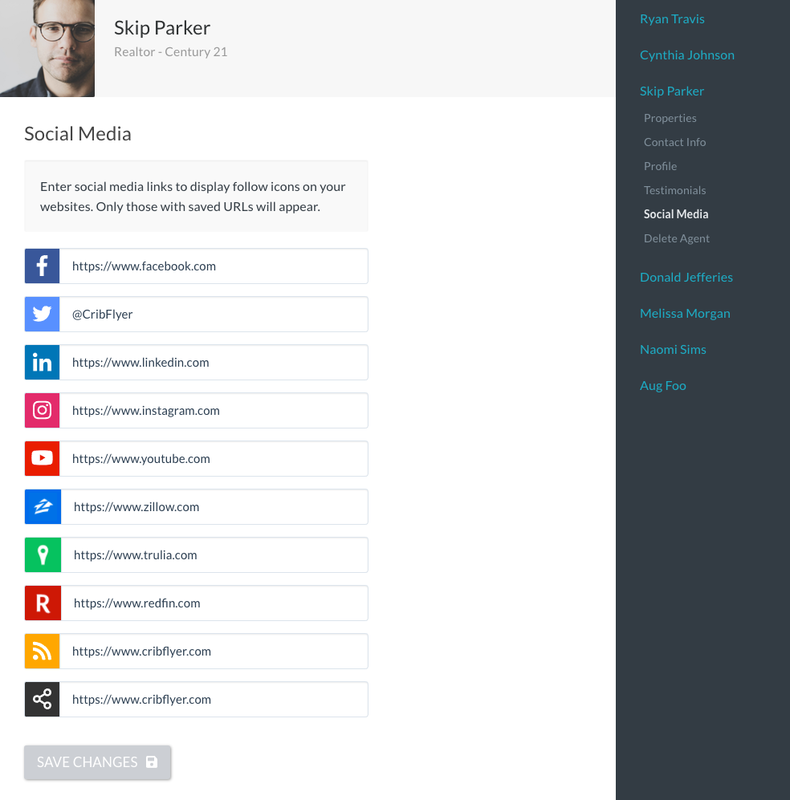 You can even require contact information before visitors can view your documents (lead capture). You can also password protect your documents with a special access password of your choosing. Watch a video demo of the document upload feature here. Can I create an "unbranded" version of my property site for the MLS that doesn't show agent contact information or company logos? "Unbranded" MLS link using a custom domain name. "Unbranded" MLS link using default CribFlyer URL. Can I hide the actual property address or use an approximate address to keep the actual address confidential? Yes. 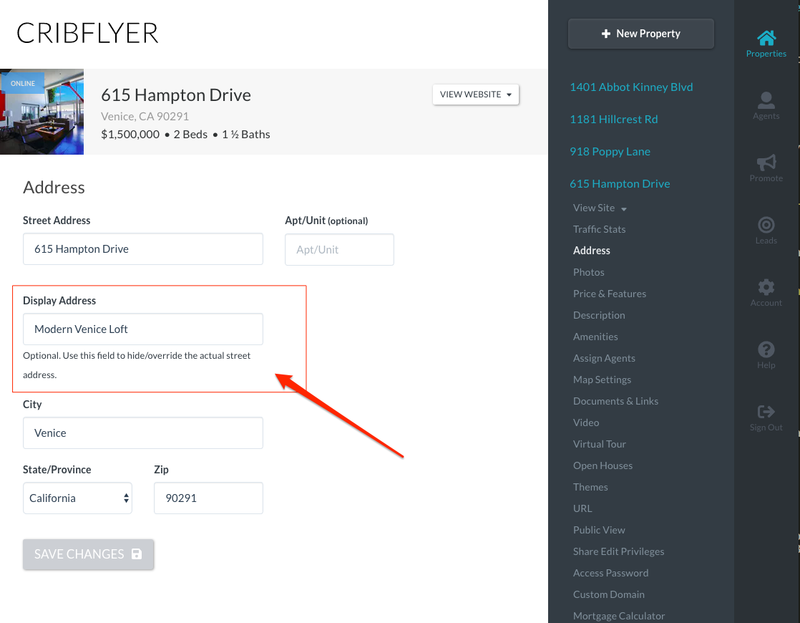 We have an address field called Display Address that lets you hide or override the actual property address. If the "Display Address" is used it will hide the actual address on all website themes. You can also drag the pin marker on the map settings page in your admin panel to further customize what's displayed on the map. You can also hide the map completely if desired. Are all features included with all account subscription levels? How do I prepare and upload photos for best results ? We recommeded photos be at least 1600 pixels wide and between 3 MB and 10 MB in size. Our image processing software will automatically optimize and enhance your photos for web and mobile devices. It will also create alternate thumbnail sizes of your photos. You can upload 48 photos at a time and we allow up to 100 photos for each property. Can I add a videos to my property site ? Yes. You can one or many vidoes. If you have vides(s) of your property simply upload them to YouTube, Vimeo or Wista and then display them on your property site by plugging the video URL into our admin panel. Can I embed 3D virtual tours ? Yes, you can embed as many as you like. We currently support Matterport, iGuide, Immoviewer, Tourbuzz and TruPlace virtual tours. You can display the virtual tour by plugging the tour ID into your admin panel. You can find the tour ID in the "embed code" or tour URL given to you by your provider. More detailed instructions for each tour provider can be found in our admin panel. If you'd like to use another virtual tour provider and they support "embed code" then please send us a support request and we'll consider adding it. Can I upload and display a 360° Panoramic photo taken from a 360° camera? Yes. We support images taken using most 360° cameras. 360° panoramic images must be uploaded in equirectangular format (which is the most common format used by these types of cameras). Equirectangular images cover 360° horizontally and 180° vertically, thus your equirectangular image should have an aspect ratio of 2:1. Can I embed iFrame content from another source? Yes. Just make sure the content is responsive, meaning that it displays nicely on phones, laptops, tablets and desktop computers. iFrame URLs can be embeded by visiting the "3D Tours and other Media" section of your admin panel. How much does CribFlyer cost? We have the following plans available. The "per website per month" cost goes down significantly as you move to higher volume plans. CribFlyer subscriptions are month-to-month with NO contacts. You can upgrade, downgrade or cancel your plan anytime. When a property sells can I remove it the make room for another website? Yes, just delete a property when it sells and you'll have room for another website. You can have as many websites as your subscription plan allows. Our service is "subscription" based NOT "credits" based. Do you have features for photographers, virtual tour companies or large brokers ? Shared Editing Privileges. 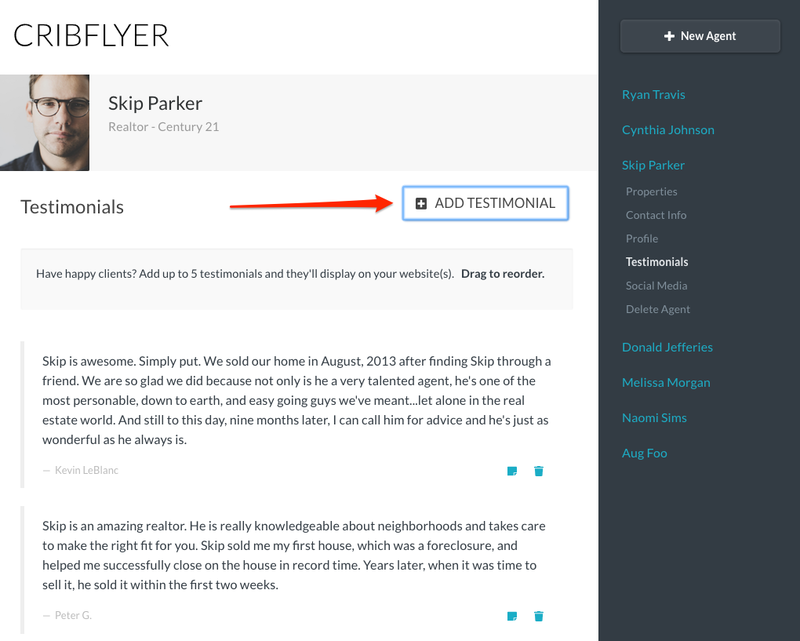 Send your client or agent a special link that allows editing privileges to a specific property only. They'll only have access to a limited set of editing features and won't be able to see or make changes to any of your other properties, agents, leads, or account info. Please note that anyone with a special edit link will be able make changes to that particular property website. You can revoke previously shared edit privileges at any time. Branded vs Unbranded links. You automatically get two versions of your website. One with agent contact information and one without. Just append /mls to the end of your website URL to view the "MLS friendly" unbranded version. ZIP file downloads of your photos. Easily deliver photos to your agents or clients. Can I assign different agents to different properties ? 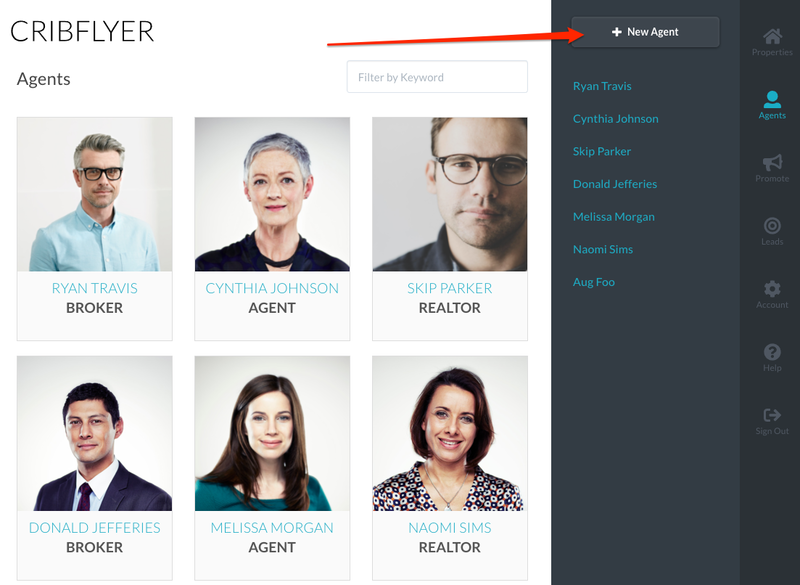 Yes, you can add as many agents as you need and assign them to any of your properties from within your admin panel. Their photo, bio, testimonials, social media links and contact information will be displayed on each website they are assigned to. Can I assign multiple agents to the same property? How much can I customize the look of my websites ? 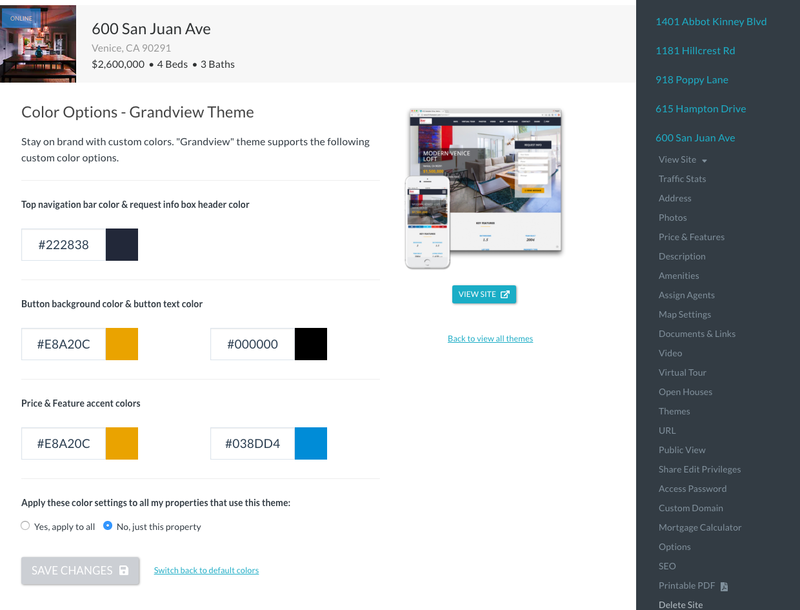 We have a library of design themes you can choose from with the ability to set custom color options. 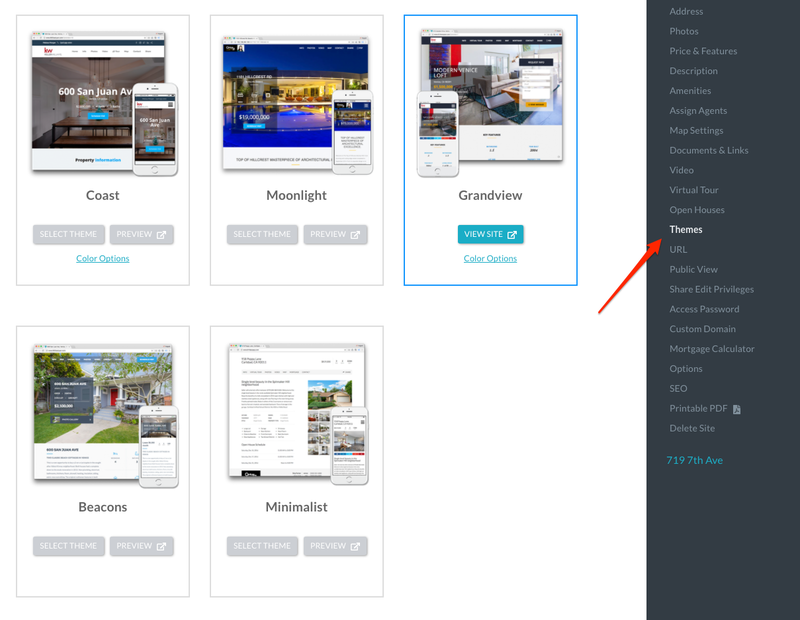 Themes control how your website looks. Over time we will continue to add new themes to stay current with design trends. We can't make customer specific design or layout changes to our themes. However, we will consider customizing or creating a new theme if the request is reasonable and will benefit all users of our platform. Can I remove the CribFlyer branding from my websites ? Yes. 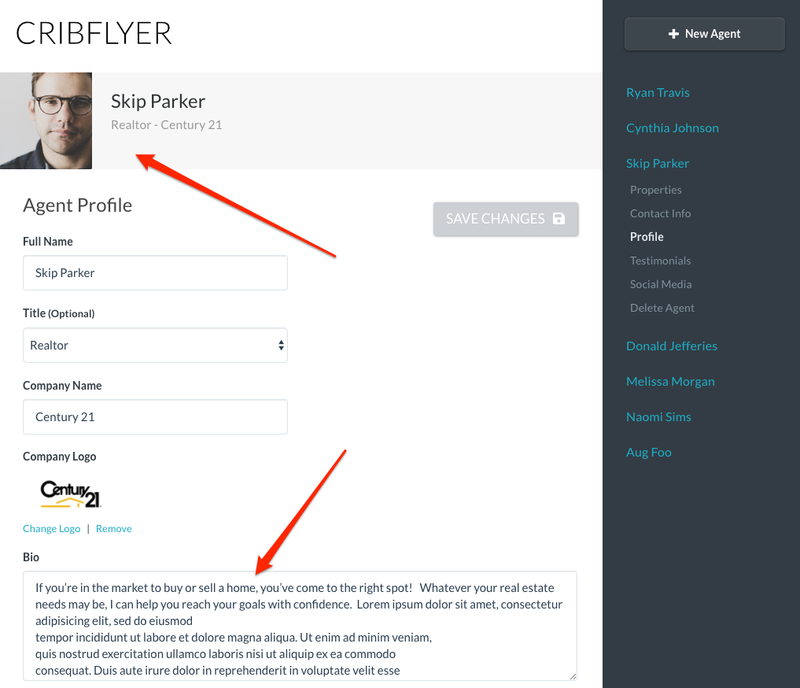 You can hide the "Powered by CribFlyer" branding link on each property website from within your admin panel. Can I create a private password protected website ? Yes. 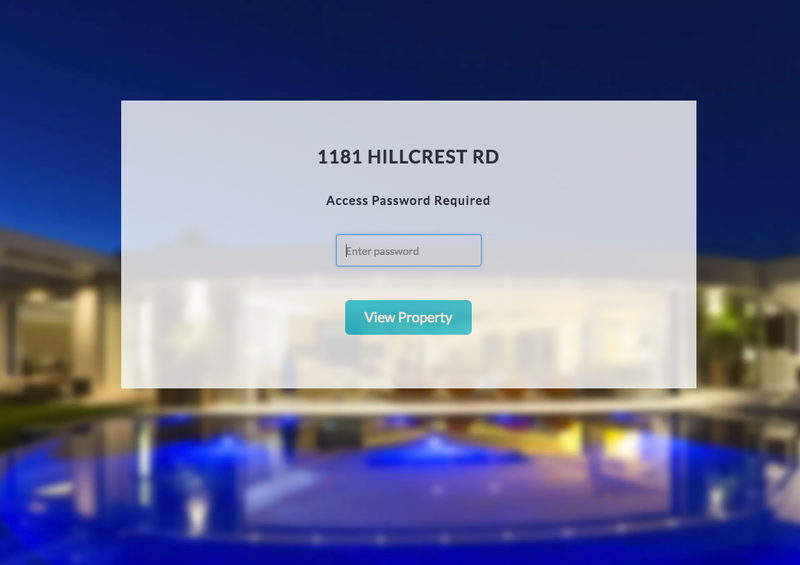 Each property can be password protected and you can email the preview URL to your client and prospective buyers. This access password is a separate password for each property and different from your main account password. 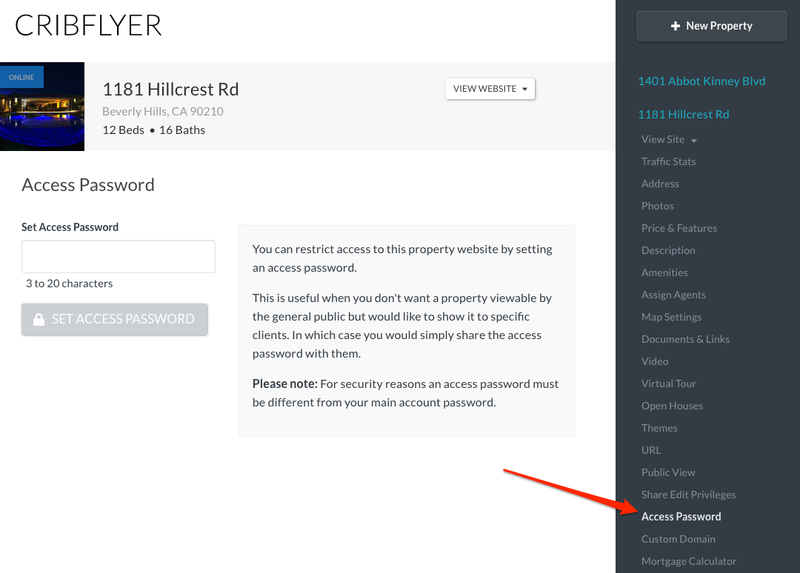 You'll see a link in your admin panel under each property to setup an access password. We added this feature because some sellers are particular about their privacy and do not want images or details about their homes searchable online. Do you support multi-unit properties, investment properties or larger real estate development projects ? Not yet. However we are working on themes and features to support building websites for these types of properties. Please send us a request and let us know more about your needs in order to help us build these features.